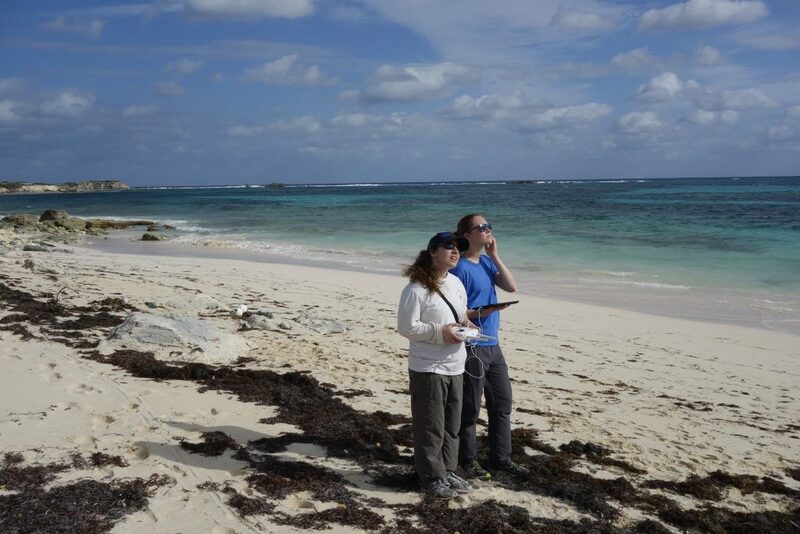 This case study details a research trip during January of 2016 to San Salvador Island, The Bahamas. 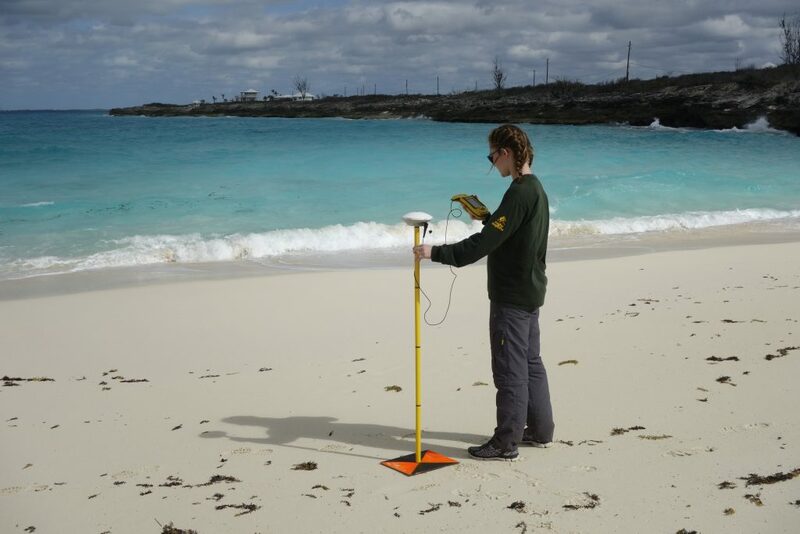 The purpose of this venture was to survey coastal erosion on the island, caused by Hurricane Joaquin in the fall of 2015. 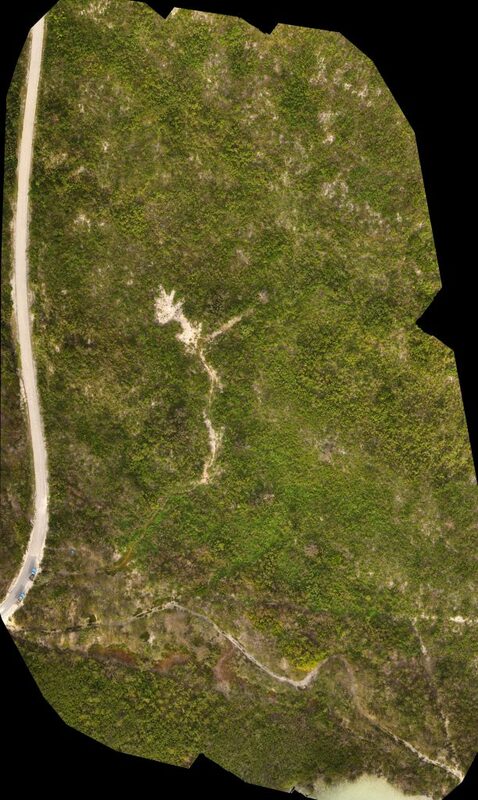 The department of Geosciences at Smith College asked for the Spatial Analysis Lab’s help in collecting imagery of the eroded coastlines. Several researchers from other institutions (UConn, FGCU, and Temple) were also present during this time. Using the SAL’s quadcopters and knowledge of orthomosaic image processing, we were able to successfully collect high-resolution imagery of the areas of interest; however, difficulties arose during the trip due to technological limitations, inclement weather, and miscommunication. The main challenges we faced largely stemmed from breakdowns in communication. Quadcopters (and their operators) have certain limitations and comfort zones for safe, successful operation, while researchers often have particular desires for the outcomes in their research. Internet Connection and Map Caching: At the start of each day, in order to fly successfully, we needed to know where we would be flying prior to leaving the research center. Using the mission planning apps required map data of the areas to fly, so that we could see the land characteristics and plan our missions appropriately. The Wi-Fi connection at the research center was spotty at best, though, which frequently made loading the maps a time-intensive process. Type of batteries: Since quadcopters run on lithium-polymer, or LiPo, batteries, special care has to be taken to make sure the batteries are safe to work with. If not cared for properly, LiPo batteries may explode. Additionally, most quadcopters have brand- and even model-specific batteries that are often expensive. (Phantom 3 batteries, for example, are ~$80-100 apiece.) To keep everyone safe and take good care of our batteries, we had to monitor them carefully and store them in a spare cooler while we were out in the field. Charging: When a battery is discharged during use, it must be recharged to get another flight in. However, a full recharge often takes about an hour if the battery is very low. Since we only had 4 batteries for our main quadcopter, this limited the number of flights we could do in a day. (There are federal limitations on the number of LiPo batteries you can travel with on an airplane.) We also had to take time on our last day to discharge all of our batteries before flying home, since LiPo batteries can only be taken on a plane in a discharged state. Flight duration: Even with all our batteries fully charged, our quadcopters can only fly for 18-20 minutes maximum … on a good day. When all systems are running and the vehicle is doing its best to fly its mission, sometimes it can only fly for 10 minutes before needing to land (particularly in a strong wind). We used a DJI Phantom 3 for all of the missions flown on this trip, due to it working well even in strong wings. Wind: Although newer quadcopters have incredible GPS stabilization, high winds can spell disaster for a mission. Flight duration dramatically decreases when the vehicle has to fight the wind to stay on-course. We felt that any winds over 15-20 miles per hour were unsafe for operation, in case of a runaway drone. Water: Quadcopters’ motors often have exposed wire coils, or openings for ventilation that are not waterproofed. Water and quadcopters do not mix, so inclement weather often put our missions on hold until the sky cleared up. We also had to be careful not to fly over water on low battery in case the quadcopter made an abrupt landing and ended up in the ocean. Another beautiful day at the beach… taking GPS waypoints. Sun: Although a bright, sunny day sounds ideal for flying on the beach, direct sun actually is more trouble than it’s worth. Even with the screen brightness turned all the way up, it’s hard to read an iPad in full sun. Also, while flying, it is good practice to keep an eye on your quadcopter to ensure it is still flying the mission as expected. 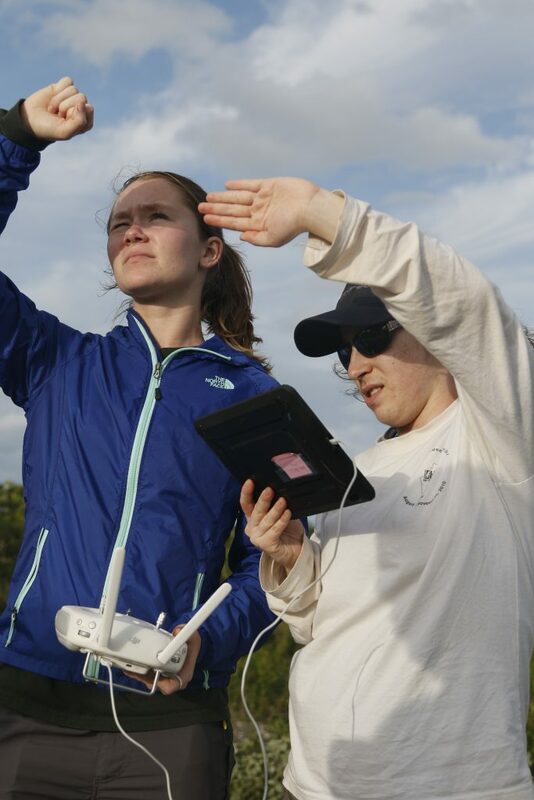 When it flies in front of the sun, keeping track of the quad is not easy – especially when it’s fifty feet in the air and several hundred feet away (at which point you can’t hear it buzzing anymore, either). Even squinting, sometimes it’s very difficult to keep an eye on the drone when it’s bright and sunny out. Also due to the sun, the camera settings have to be adapted to the subject matter; we found after our first few missions that all of our imagery was completely overexposed due to the brightness of the beach sand. On our first day, we flew our first successful mission … or so we thought. Upon finishing image processing, we realized that the bright white sand had completely washed out all of our images. Back to square one! Mission planning: As mentioned earlier, a quadcopter can fly for about 15-20 minutes on a perfect day. However, external factors often decrease this duration significantly. When plotting the polygon that defines the area covered by the mission plan, we had to carefully consider the estimated time and factor in how much longer it would actually be due to the wind. Sometimes we could tweak the length by adjusting the area’s shape slightly, since the exact flight path would automatically try to obtain “best coverage” of the area. Maintaining line of sight from takeoff: One scare we had occurred mid-mission, when we realized the flight we had planned went a lot farther away than we expected. The mission itself was estimated at ten minutes, but the beach was very long and narrow; at one point, we entirely lost sight of the quadcopter. After frantically running down the beach, we caught sight of it again, and were able to let it complete the mission. Proximity to airports: During another mission, we realized we were within a few miles of the San Salvador airport. Specific restrictions vary between countries and airports, but ideally we should have contacted the control tower to let them know our intentions. All of our flights were well below public airspace (we flew most missions at 40-50 feet), but for maximum safety, it is important to verify before taking off. Multiple research projects: As the single drone team on-site, we had to divide our time between the research teams and their several different projects. Over the course of the week, we flew 15 different missions at 9 sites around the island, taking anywhere from 100-250 pictures per flight. There were often (minor) disagreements about whose site should be prioritized, based on battery limitations and weather. Missions could not be spontaneously selected since we had to pre-cache the maps while still connected to the internet at the research center. We got to look at a lot of sites that were interesting for different reasons. This image contains a lot of land crab burrows – which you’d never know just looking at it! Time constraints: All good research takes time, and we felt it acutely during this week. We flew as many missions as possible, but we could only move so quickly. 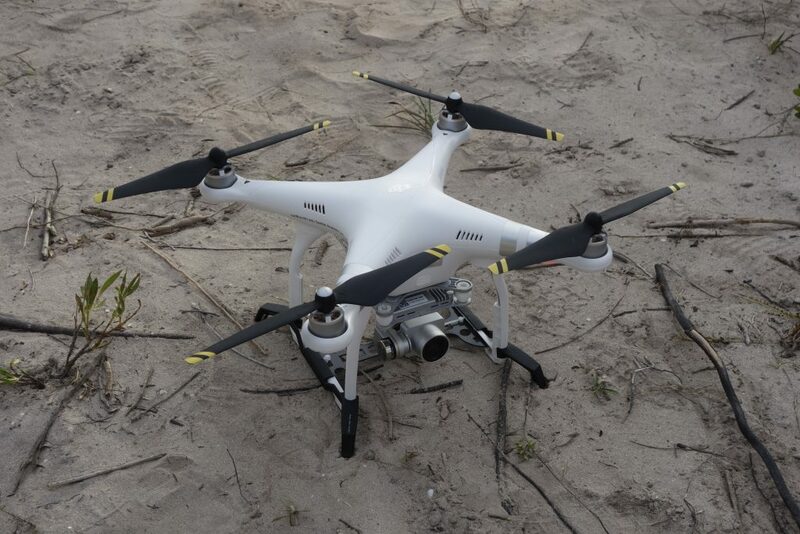 A 15-minute mission requires prep time for the quadcopter, setting up ground control points, collecting the GPS coordinates of those points, and safely unpacking/repacking all the equipment – not to mention travel time on roads that had themselves been severely impacted by the hurricane. We averaged three flights a day, though we managed to fit in five one day (with a stop back at the research center during lunch to recharge batteries and cache new maps). Whew! Limitations of the technology: The biggest challenge we faced was communicating all of the above limitations to all interested parties. The last thing a determined researcher wants to hear is, “Sorry, no, we can’t fly this region you’re interested in right now because ___,” for whatever reason. This led to some challenges when the pilots were just students; standing your ground when professors are pushing for a flight that we felt uncomfortable performing is not easy. All in all, a successful venture! Despite all of the above challenges, this research venture was an incredible experience for testing the capabilities of this technology. Even with the difficulties we faced, this was a successful trip and a great learning experience for any future endeavors. 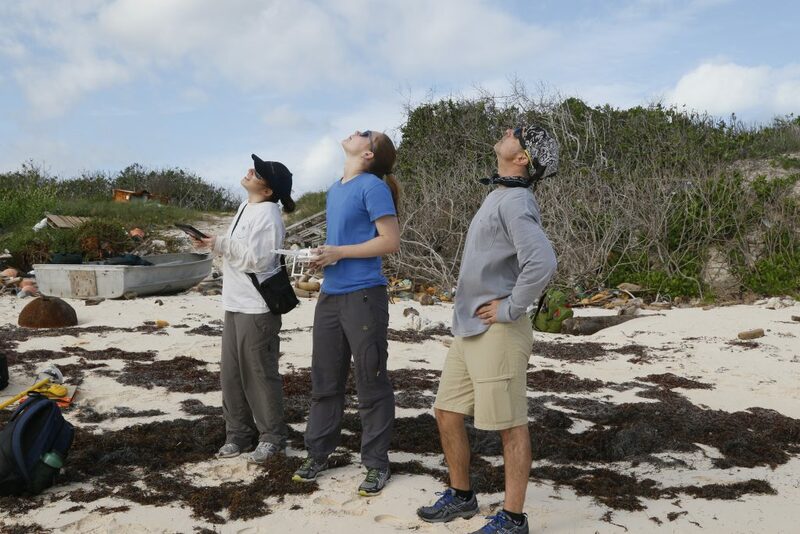 As pilots, we received co-authorship of a paper on land crabs, published from Temple University; Smith’s own Geosciences department is even doing a follow-up trip in January 2017 to continue tracking erosion on San Salvador. Through work like this, we are continuing to establish the usefulness of drone technology as a tool for researchers everywhere. Consider the challenges we faced on this trip. What is one challenge that really sticks out to you? What are some possible approaches you think may help to alleviate this problem? What other problems do you anticipate may occur when completing a research endeavor like this? How would you deal with a situation of being the resident expert on a technology and having to tell an authority figure “No”?